Choosing to complete Senior School at Mueller College means experiencing……..more than a school. Together with the primary and middle sub-schools, we aim to equip all students for life in the world and eternity, by applying biblical principles, through an excellent education in a distinctly Christian environment. Mueller Senior School offers a diverse and flexible program to ensure each student is able to pursue their pathway of choice. In a rigorous and stimulating academic environment all students are encouraged to become independent learners. Whether students plan to undertake tertiary studies or head directly into the workforce, the Senior School program allows each student to work towards achieving their individual goals. 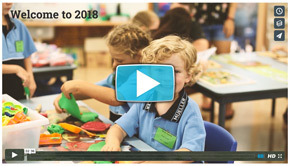 Designed to prepare and equip students for life after school, the teaching and learning in Senior School focuses on providing students with knowledge and transferrable life skills. We aim to provide all students with an in-depth understanding of the world around them to ensure they graduate as well-educated, independent young adults, ready for life in the world and eternity. Current teaching and learning practices, and current assessment and reporting frameworks, are maintained and enhanced through regular professional development of all teaching staff. The whole-school approach to education at Mueller College provides students opportunities to serve and contribute within the different campus communities; early childcare, prep, primary, middle school, senior school, retirement village, and Mueller Community Church. A dedicated and committed team of teachers and learning staff afford students every opportunity to learn and develop God-given potential. Not only is the delivery of an engaging and quality curriculum a priority, but also the pastoral care of students, and the facilitation of a safe and supportive environment that offers all students an equal opportunity to develop physically, mentally, emotionally and spiritually. Healthy and genuine relationships are forged and enhanced throughout Senior School, and celebrated at the family friendly Graduation service and final Chapel, and an alcohol free Senior Formal. A broad and diverse range of subjects are offered in Years 10 -12. Students in Year 10 are presented with many different pathways to investigate, with the variety of VET pathways ever increasing. Subjects on offer in Year 10 comprise of the core subjects, and 3 electives. Core subjects: Maths, English, Science, History, Biblical Studies and Sport. Electives: a choice of 3 from the Year 11 / 12 subject list. VET courses provide students with valuable work-related knowledge and skills through a nationally recognised qualification. Student achievement is based on industry-endorsed competency standards. In Years 11 and 12 students are able to select VET courses from a range of options including the following Certificates which are offered as part of the school curriculum. Students enrolled in this course are required to pay the course fee of $150. These courses provide students with the opportunity to develop practical workplace skills. Students who enjoy ‘hands-on’ learning will enjoy this way of learning. In addition to these courses, students are able to undertake VET courses off-campus with other training providers e.g. TAFE and a range of private providers. Some courses on offer are Children’s Services, Health Services, Fitness, Media, Automotive and Engineering. A complete list is available on request. Completion of VET certificates provides students with vocational skills and knowledge which will enable them to obtain part-time or full-time employment. Some courses can be used towards further study at TAFE or other private colleges. All courses earn points towards the QCE. Students can download the following documents about the services they are to receive, and their rights and obligations. All family and friends are welcome to attend weekly chapel services and Mega-chapels. The firm implementation of the college ‘Behaviour Management’, ‘Anti-bullying’, ‘Mobile Phone’ and ‘Assessment & Assignment’ policies, reinforces a secure and resilient student community. 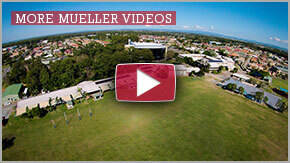 Mueller Senior School is …………… more than a school. Come and see what we are about at one of our many headline events – Mueller Sports Awards Dinner, Presentation Evening, or Mega-chapels. Or simply book a tour of our campus.